The former billionaire was ordered to stop moving assets out of the reach of the bank formerly known as Anglo. FORMER BILLIONAIRE SEÁN Quinn has escaped a jail sentence – for now – after a judge ordered him to stop moving assets out of the reach of the bank formerly known as Anglo Irish Bank. Justice Elizabeth Dunne said she will only look at punitive measures such as a prison sentence if Quinn does not cooperate with the order, RTE.ie reports. 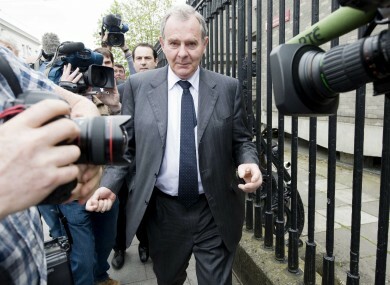 Quinn, his son Seán Junior, and his nephew Peter, were all found guilty of contempt on Tuesday for breaking a High Court injunction forbidding them to move assets out of the reach of the former Anglo Irish Bank. Judge Elizabeth Dunne said that she was “not impressed” with the way the three men gave evidence during the hearing and described Seán Quinn as “evasive and uncooperative”. The Irish Bank Resolution Corporation, formerly known as Anglo Irish Bank, is pursuing Quinn to try to recoup around €3 billion which it says it is owed. The IBRC maintains that members of the Quinn family have conspired to move the family’s property portfolio around to stop IBRC from accessing it. It says it will continue to try to recover “as much of the remaining assets as possible on behalf of the Irish taxpayer”. Email “Seán Quinn escapes jail – for now – after being found guilty of contempt”. Feedback on “Seán Quinn escapes jail – for now – after being found guilty of contempt”.